Well, it can be really fast sometimes, like performing complex replacements or macros. And that is absolutely magical. But that is not something that I use constantly, and it only save a noticeable amount of time when those operations should be performed tens, maybe hundreds of times. Of course, it also will reduce greatly boredom of repetitive tasks. It is still a great win. But those are exceptions on your day-to-day operation. If they are the rule, probably you should consider a change of job! I have the same expression when looking not commented code. In my mind it sort of compares with knowing how to touch-type. Developers, contrary to Hollywood opinion, are not typists from the 50s, typing tirelessly for hours and producing massive streams of characters. We write small burst of code between long reading and thinking sessions. The best analogy that I heard (I can’t find the reference on Internet right now 😦 ) is that we act like samurais in anime, just staring at the code, analysing them carefully. Thinking, thinking, thinking. And suddenly, in a blink of an eye, we draw our sword and hit with precision, to then stand still, in a dramatic pose, as we see our enemy cut in half. Touch type is not important because it allows us to generate double or triple number of words per day. It is important because it eases the process of getting out of thoughts at that critical moment. You don’t add speed, you add control and relax. You don’t have to manage the stress of getting your body to press the keys and some symbols appear on the screen. You just think on writing something and it appears on the screen, with your body handling the problem and freeing your mind. I have to change the parameters of this function. Decide action: I’ll delete those words between the brackets and write the new params. * This can also be deleting each character, but I’m trying to be an “advanced user” here. Are we there yet? No. Are we there yet? NO. 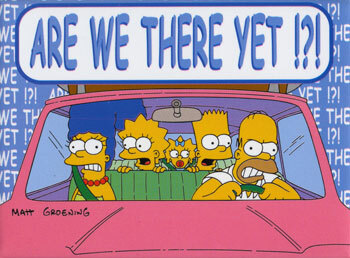 Are we there yet? NO!!! Wait, YES! Now delete. Decide action: I’ll change those words between the brackets. Here, the part when I spend the most energy is in operation 2, determining what is the part I have to change. In this case, is easy, as I set as example something between brackets (ci( will do), but it is a quite common case when you’re editing code. But it can be more difficult, like “up to the character X (coma, semicolon)”. I am getting better with practice, but it is not automatic, I have to think about it. That’s the part where the learning curve kicks in. It’s not about knowing what to do. It’s deciding what (of a myriad possibilities) option is the correct one. Or even if there is one that you don’t know yet that will work better. Move one character at a time? A word? A block? Count the number of lines? Etc… Deciding the proper action without much effort, instinctively, takes practice and conscious teaching yourself possible moves (that you can reuse later for more operations). After all, the code tends to repeat patterns, and there are a lot of actions that helps with specifics of the language, like indenting in Python. And that makes a lot of sense. My mind thinks naturally on that kind of actions, so it’s more natural than rearrange some sort of symbols on a screen. All the part of reading and thinking takes the same time, and actually using the editor to change the code is a small part of my working day. Saving some keystrokes is not going to allow me going home two hours earlier. And trying to optimise in keystrokes can take a lot of time just thinking. But, when I make a change, I am able to do it spending less mental energy. It feels more natural. I need to think less in the characters. The editor gets less into the way of getting the text into the image in my mind. I still have to think about what action to do, but it is a much more natural approach. And that is the power of Vim. Not that is fast. Not that you can do a magical operation with few keystrokes. That it stays out as much as possible of the way between you and your code. That maps your thoughts once you know how to use it. And that’s why I don’t really care about Vim “speed”. I am not “faster” using Vim. I do not generate noticeable more code at the end of the day. But I generate it with less effort and caring more about the quality than battling with my keyboard. I am more relaxed, more in control, focused in what matters. Caring about getting stuff done. More productive. That’s Vim killer feature. UPDATE: There is some discussion in Hacker News, if you want to take a look. Thank you for this great article. This makes me want to use vim because now I understand what happnes when we use it which was not the case with the bunch of articles out there about vim saying you’re so much faster with it. That’s great! I’d recommend to take it easy (it is very weird at the beginning) and try to learn ‘making sense of it’. There are lots of (useful) isolated tricks , but the important part is to understand (and apply instinctively) the basics. Vim is not fast for you because you are not really using it right. Keep using it, and abandon all that stuff imposed by the IBM-standard-style editors and you will discover how slow you really are. You actually pointed it out in the paragraph: “Here, the part when I spend the most energy”. You just need more experience and practice to grasp it. Stuff like using hjkl instead of arrows is important, not because of the time spent in moving the hand over the keyboard, but because it starts teaching your brain that everything can be relearned. The point with Vim is not it runs macros fast, the point is it lets you map your keyboard directly to your brain. But Vim is not intuitive, it requires practice and work. Give it the time it needs (also for @Lucian) and you will never come back. Well, I am faster using Vim. I totally agree on you on that. My argument here is that I don’t use Vim because is faster. I use it because, after learning (and I have still lots of things to learn), it maps better the way to approach editing text. Yes, it is faster, but the point is not writing faster. It is writing better. I guess that I get your point now: lot of the people who say that “Vim is fast” are somehow implying a deeper motive and you are trying to explain it. Just so you know, in JetBrains ides, these two steps would be a simple ‘cmd+w’ key struck. I like vim, but I believe that for most vim users I met, if they spend the same amount of time learning JetBrains ides as they did with vim, they could write develop faster. I don’t really want to enter into the “vim vs IDEs” discussion, as I think is at least pointless. What I’m trying to explain is WHY Vim works and how is different from other forms of edit text. I’m not sure that vim step 3 really counts as a separate step. Also, steps 5+6 should really be “hit ‘caw'”, because no-one does a delete and then goes into insert mode. Lastly, the example picked is something that a JetBrains IDE can clearly do well. How would it deal with something a little more complicated like replacing the first two parameters to a function with one new parameter? (assuming there are a third, etc, parameters). Sorry, I’m not sure that I understood correctly your comment. Do you refer to the Vim step example or to the “others” step example? Steps 5 and 6 are only on the “others”. Thanks for pointing out my mistake in vim step 5 and 6. I wasn’t talking about IDE vs vim either (nor was I trying to dimiss your logic on why vim is so great, it is!). I was just trying to point out that other editors (IDE included) is not that inferier compared to vim, it is just they take some learning curves too. BTW, there is an vim plugin (developed by JetBrains) for JetBrains IDEs, so it can have the power of both vim and IDEs. Using vim without good personalized configuration and a few crucial plugins is pointless. With incsearch and hlsearch set up you have exact same thing. Just without annyoing windows and slowness of the IDE. As I understand, cmd+w edits parameter? With proper text object you have the same, again without annoying popping windows: simply type cia(change-inside-argument). 1) type /lorem Hit enter. About 5, I have it mapped to the capslock. Works great. But it’s search-based paradigm. It could be better, for example with easymotion. I have mapped command that will ask for two chars and will get me in the place on the page where they reside. Probablity of many such places are quite small, but possible, in that case I addictionaly hit assigned key from home row. It’s mapped to lower-case s.
user could easily got to know they has made a big change and the editor area are really not editable . i notice that many beginner would fear when they sometime hit [ESC] and found the editoring area didnt responsing their inputs,this might let them assem that they made a mistake which let the editor freeze. I’m not sure. I think that an app should work for common use first. I’ll find very weird that it started in INSERT mode, as default mode, well, it’s the default. I don’t have really an answer about how to help beginners, but I don’t think that changing default behaviour is the way to go. If anyone is interested I released a book called Pro Vim last year: http://www.amazon.co.uk/Pro-Vim-Mark-McDonnell/dp/1484202511/ref=sr_1_1?ie=UTF8&qid=1417554324&sr=8-1&keywords=pro+Vim check it out regardless if you’re a beginner or long term user. Thanks for the note, Mark!. Will take a look.